Dredging operations in the West Calcasieu Port’s west barge basin were completed today and that all tenant operations in the basin have returned to full operations, port officials announced today. 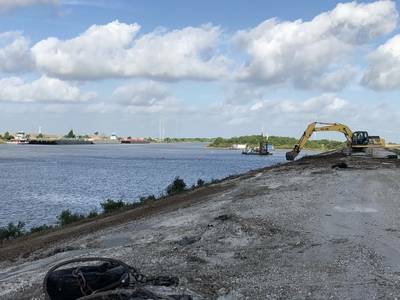 Coastal Dredging of Hammond, La., was the contractor on the $1.3 million maintenance dredging project that removed more than 140,000 cubic yards of spoils over a 10-week period. The port’s barge basin depth was returned to a minus-10 feet, and the spoils were relocated into the ports federally mandated spoils reception area located nearby on port property. “It has been more than eight years since the port’s barge basin was last serviced, and over that extended period of time, the basin attracts a considerable amount of soil due to constantly moving currents along the Gulf Intracoastal Waterway where the port is located,” said Lynn Hohensee, port director. He explained that use of the spoils – as in the past dredging operations – has an economic beneficial use, because the port’s long-term strategic plan calls for the spoils area to eventually become a viable development site for future tenant occupancy. Hohensee said that the West Cal Port and its tenants offer a variety of specialized services that accommodate our regional marine operations community. “High on that list is commercial shallow-water barge fleeting operations along the Gulf Intracoastal Waterway by Devall Towing,” he explained. “Demand for barge fleeting facilities in Southwest Louisiana has grown over the last several years, and all regional economic indicators point to a continuing growth in that demand. “For that reason,” Hohensee continued, “our port board of commissioners has led the way in applying for the state funding that made this barge maintenance project possible. “Our expansion project would not have been possible without a $1,044,000 million Port Priority Fund grant awarded to the port by the Louisiana Department of Transportation & Development,” he said. The port’s largest and oldest tenant, Devall Towing, currently operates one of the largest barge fleeting operations along the Gulf Intracoastal Waterway, and the company has seen a marked increase in demand for barge anchorage in Southwest Louisiana. Also providing barge cleaning/stripping/repair services at the port are River Barge Works and Tubal-Cain Marine Services. Located 12 miles south of Interstate 10 and just west of Highway 27, the WCP has 7,000 feet of waterfront property on the GIWW. Current tenant activity includes barge-fleeting operations, marine construction, dry cargo barge cleaning, wet-barge cleaning, diesel engine repair and concrete pumping.